Location: Forum Index » Scrapbooking Forums » General Scrapbooking » What's do you keep on your scrap table? What items do you keep within arm's reach when you are scrapping? Markers, pens, stickers, paper, glue dots. I have to work quickly because sometimes I don't want to get lectured by my parents for a mess. Sorry Maria, you are dreaming!!! I moved my inks in a storage shelf on my desk and while the pads are not sitting on my desk for days at a time paper is!! Paper from my current project which sometimes takes me days to complete multiple layouts for an event. My utility bag with all the basic supplies sits on the desk along with a computer at one end and the Big Shot at the other. Also have the glass mat that is always on my desk. Don't believe TH when he tells you things don't encroach onto the mat!!! Can't blame a girl for trying! So, I decided to do a reality check of things I never used or used so seldom, it's been years. Made a goodie bag of giveaways for my weekend crop: brads, buttons, unfinished chipboard shapes... get the picture? I really need to look at what I need in arms reach. Thanks for letting me know what you all put there. It'll prompt me to think about the way I scrap and what I need close by. Everything is on the top of my table now! Ha! Going to clean up in a bit after finishing my latest layouts! Hopefully I will be able to get it down to the usual papers and pens. Here's my work table cleared off. 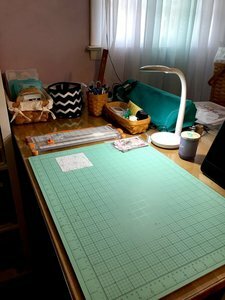 I use an IKEA kitchen island for my work table and allowed only a few things to remain on the actual desk top: a cup of pens, scissors, rulers, brushes, etc. and a small basket with an ink pad, corner rounder, tape runner, and extra cutting blades. I feel these are my essentials. Other, frequently used items have been rearranged on the shelves next to and behind me for easy access (other adhesives and refills, paper punches, scrap paper, etc). The black and white 31 bag is for paper trash. The Cameo and the longer bread basket will be finding a new home on the shelf below the island but I am still working on getting that cleaned off. My work table contains all the tools and supplies I can't find when I need them, which will require a trip to the store to buy a new one (and a bunch of other stuff I don't need, but justifies the trip) so I can find the one I couldn't find, because it was right there in plain sight. Don, the craziness of this is that I JUST did that when I couldn't find my bone folder. Looked everywhere for a week and finally went and bought a new one. It fell out of a bag that was on my desk YESTERDAY! Thanks for the laugh. My tools are all in a large scrap tote, which sits on the right hand corner of my desk. Every now and then, I go thru it and remove the "tools" I do not use in place of something I reach for often. On the left side contains a paper-made organizer in which I put pop dots, pencils and chapstick. The front/main part of my desk holds my mat and ruler and just beyond that my silhouette. Computer is to the left of my cutting machine. Then there are the piles to the far right and far left of my desk (my desk is huge)!!!!! BUT I do clean up the piles after every project cause otherwise I wouldn't get anywhere with my next adventure. Vivian, Is your tools tote one of those tall ones with the handle and 4 sides? I have been contemplating getting one of those again. I crop at home and away about equally so it'd be nice to have a tote packed at the ready. I'm trying to keep everything to one side that I use most of the time. I do try to clean up after myself but b/c I work in short spurts when I'm at home, I usually work on a project for several days and leave it out. That's where the mess comes in. I'm hoping with my recent reboot and small purge, I'll have a little more neatness, lol. My desk is never tidy lol. It’s one of those long IKEA desks with drawer units on each end. On one end of the desk is my paper trimmer (and a pile of papers I’ve cut but have to put away). In the middle against the wall is my Cricut. I pull it out when I need it, but then push it back against the wall when I’m done. The other end seems to collect memorabilia, photos, rulers, pens/markers, etc. I’m decent at putting some of my stuff away (once I finish a page), but somehow it sitll looks like a mess. Maybe some century I’ll clean the room and desk. I am going to the different person....I have all of my tools, stamps, inks, pens, punches, adhesives, dies in my scrap furniture drawers... I have my papers in 12 x 12 plastic drawer towers. I do not keep tools on my table unless I am using them for that project. my table seem to always be full of papers and layouts that are in progress. This is what I have on my desk at the moment. Working on 1 of 2 onesie cards for upcoming baby showers. As far as tools, trimmers, etc., my desk always looks like this. I have a lot on it, but it works for me. Edited by Andra Hoffman on 01-27-19 10:11 PM. Reason for edit: No reason given. Andra, your desk looks neat and tidy even though you have a lot on it. Mulan and Linda, I feel your pain with the paper mess. It's never ending! I had an idea when I was cropping this weekend and I started putting all layout leftovers in a large zip lock bag. I may grab a large box top for home and use it when I'm scrapping. After I'm done, I'll put way what is in the box to keep my desk top clear of multiple LO's. My friend and I were discussing the most efficient way to scrap at a weekend crop when your space and time are limited: keeping only most used tools and those you want to remember to use, within reach. I don't mind getting up and down but after foot surgery, it was a big issue and it was frustrating not to have what I needed within easy reach. I have all of my tools, stamps, inks, pens, punches, adhesives, die in my scrap furniture drawers. Way too much stuff! Efforts to thin things out meet with failure, however, as my magpie tendencies usually result in the whole sorry mess taking shape again mere days after I tidy it and put things in new places. Marie Kondo is not allowed in my craft space. Seriously . . . .